This article is and Excerpts from the book: Foldforming and is about Charles Lewton-Brain’s experience with Klaus Ullrich in Germany in 1980-81 where he found out about the origins of fold forming. In 1979 and 80 I went to study at the Fachhochschule fr Gestaltung in Pforzheim West Germany at the suggestion of my teacher Christian Gaudernak, who had studied there in the early 80’s. Mistakenly believing that everyone spoke English I went to the school and was told to come back when I spoke German. Six hard weeks spent on the bare floor of an apartment with my girlfriend studying German from Berlitz and help finding a job from an Italian guest worker led me back to the school where I said “yes” and “no” to every question. The interviewer commented “Well, now you speak German” and I was in the school. I had gone to study with Reinhold Reiling but had uncomprehendingly said “yes” to Ullrich. This turned out to be excellent for me and shaped my life. That year Reiling became ill with leukemia and died the following year. Ullrich had along with other goldsmiths led something of a revolution in the late 50’s and through the 60’s in Europe first by choosing to fuse jewelry together rather than solder it. Up until then this had always been a ‘mistake’, an error. What Ullrich and his contemporaries did was say that an accidental effect could be controlled and in fact utilized in a design and compositional element. This was against all the traditions in the field in Europe and was possibly a reflection of Pollock and other painters who chose the marks of process as compositional elements. Anyway as normal as fusing now seems it had shaken the scene in the 50’s. What Ullrich gave me was this idea, to use marks of process as working elements. Some background to how he taught at the time I arrived may be necessary. In the late sixties and early seventies when Christian Gaudernak was there some 80% of the students studying at the school were ‘Gasthrer’ or visiting students who were not part of the degree program and were far more interested in studying with the professors than in attendant diplomas. Most were people who had completed their apprenticeships and in many cases their master’s papers. They therefore had no need for technical education but were concerned with design and compositional issues. Many were German but students came from around the world to study there. Americans who studied there around that time include among others Harold O’Connor and later Alan Revere. After their periods of study some went back to their own one-of-a-kind jewelry workshops and galleries while others merged into the industry system as designers or workers, taking their developed design sense with them. Echoes of the effect the Fachhochschule had may be traced across the world, I’ve seen its influence personally in Australia, America, England and South Africa. In the early seventies the government changed the educational system throughout Germany. The supposedly ‘trade’ oriented systems (the Fachochschule) were merged with the ‘university’ system. This development caused profound changes in the education system. One of the changes made in the school system was that it became much more difficult to get in to study without having a high school diploma. In some cases even instructors who did not have a high school diploma were terminated. This caused a shift in the student population from skilled working professionals to younger, inexperienced, unskilled middle class and upper middle class students. Ullrich now had to teach students whose technical skills were poor and for whom working in metal itself was a struggle, much less designing for it. Ullrich began to teach by making students play with the metal for a time and then utilize the process characteristics as design elements in their work applying his attitude of allowing the beauty inherent in what the metal wants to do to be part of the design of a piece. Students rapidly acquired a working vocabulary of design elements to work with, even without having much technical skill. For instance if they bent it a certain way, heated it thus and then rolled it so the result would be predictable and useable as a design element around which to design jewelry. Within a period of weeks students had a “vocabulary” of visual “marks” with which to work. Every student would be able to repeatedly make some dozen or so personal kinds of effects, that is that no one’s were the same. The number and wide ranging look of the different results were astonishing. Ullrich had found that at this stage the design level of discussion could be entered upon. An interesting result of obtaining formal design elements in this way was that they tended to be fast; one could obtain forms and shapes rapidly that were excellent design elements to work with. The reason working time was faster was that the metal was doing what it wanted to do instead of the user forcing form upon it. By working this way the natural characteristics of the materials were allowed to direct its forming and these in general had an intrinsic beauty to them. The characteristics of the metal begin to be more evident when one starts to consider them as graphic marks to compose with. Mark making in metal as a graphic vocabulary constitutes an interesting, vital approach to metal working which offers new paths for the traditionally trained Metalsmith. This approach was a revelation for me; to listen to the material; to use the marks of working the material as conscious choices in design; to let nature show in the work. And this was what Ullrich gave to me. Without his influence fold-forming would never have developed. 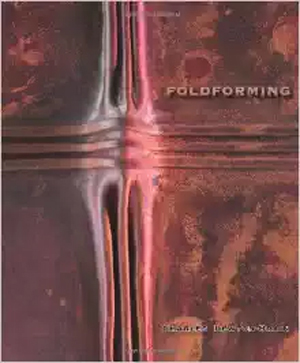 Purchase your own copy of “Foldforming (Hardcover)” today.